I am re-sharing a picture of a wall hanging that I designed and made for my Nana. Now, you should know that Nana is not related to my by blood. Rather she is my Nana by mutual choice. I consider her a gift from God. So making this was an act of love. It is not nearly as well made as I would like, but she would not allow me to take it back and remake once she had it. We both love the use of batiks in it. I hope you have a blessed Easter. He is RISEN. The Lord is Risen indeed! would not let his of this piece! It's perfect in it's imperfect state, just like us. Thanks for sharing! 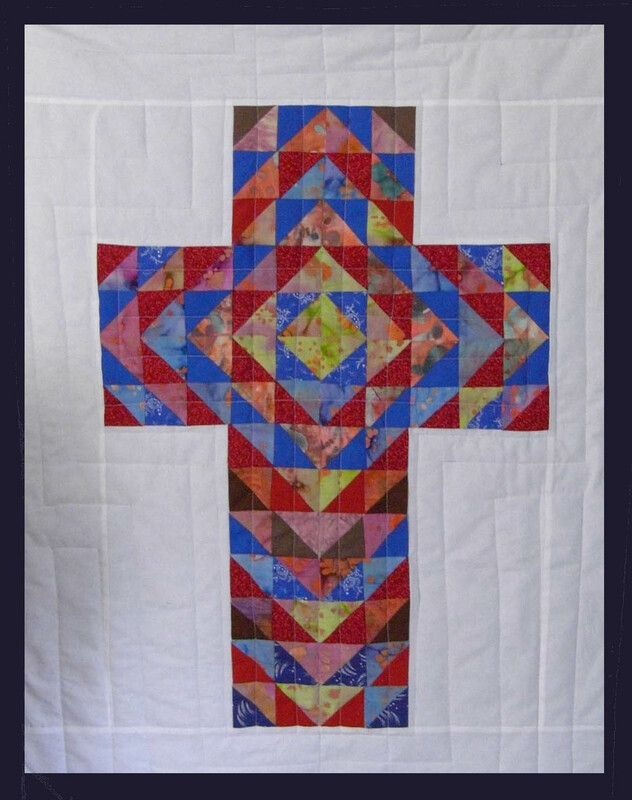 Your half square triangles make the cross radiate. He is risen indeed. I Love it!! Yes we all have angels to care about us! "I hope you have a blessed Easter. He is RISEN. The Lord is Risen indeed!" back to you too!! WOW Gene, I love it very much!! Happy Easter to you Gene! Love your quilt and your heart. YES! He is risen, and thank you for this post. Your gift to your Nana is just beautiful! I hope you had a wonderful day yesterday. The wall hanging for you Nana is beautiful. The people we choose to have in our lives are so special and it is so wonderful to be able to honor them and create for them.